*BzzAgent sent me FAGE yogurt to facilitate my review. All opinions, love of Greek food, evening snacks, and Food Network junkiness are my own. In May of 2000, Engineer and I traveled to the tiny Greek island of Aegina, situated just across the bay from Pireaus (Athens). It was there that our deep love of Greek food was rooted. 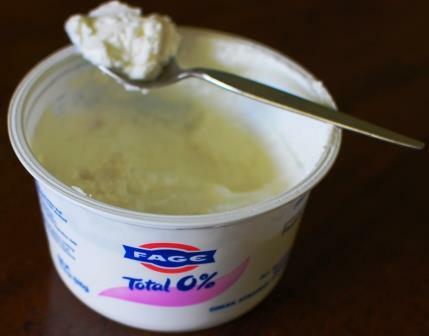 In particular, we loved the thick creamy yogurt with honey and the traditional yogurt based condiment tzatziki. Fast forward a kid and a move across the world later, we still fondly remember our time in Greece and have carried that love of Greek food with us. I like getting my Food Network on and when I saw that FAGE had teamed up with Bobby Flay for their FAGE Total Plain Kitchen I was super excited. I'm thinking that the Tandoori Style Salmon with FAGE Total Avocado Crema will be featured on our menu soon. While looking for a Ranch recipe (which was totally unrelated to this review) I came across another Food Network fave, Ina Garten and her Buttermilk Ranch Dressing recipe specifically called for FAGE yogurt. My all time favorite Greek food is the aforementioned tzatziki. Here is my recipe - just know that once you've tried it, you'll want it all the time. Consider yourself warned. Lay a tea towel over a bowl and put in the grated cucumber on top of the towel and leave it for about 30 minutes. Squeeze out any remaining juice into the bowl. Mix all ingredients in another bowl and season to taste. Leave in the fridge for a couple of hours to let the flavors meld together. Serve with pita chips, sandwiches, kabobs, pretty much anything because it is so delicious and refreshing. Greek yogurt is my favorite kind of yogurt and tzatziki is my favorite way to eat it. Thank you so much for sharing with Full Plate Thursday and have a fabulous weekend.